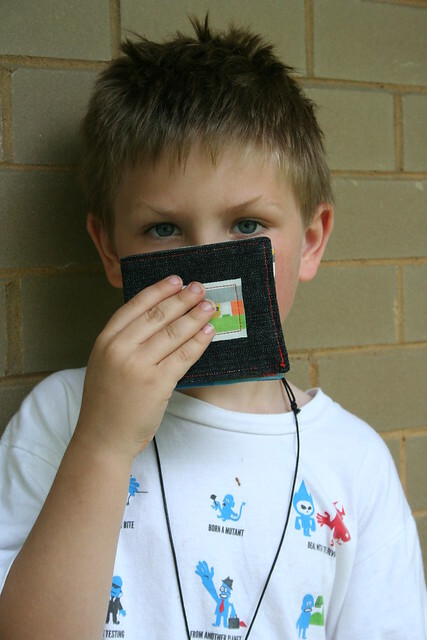 A few weeks ago my little boy asked me to make him a wallet. I (bad mommy) promptly forgot! Today he reminded me when he found his Lego Official Builder Licence (which the kids received as birthday party favors last weekend) and wanted a special place to put it. I had a little time on my hands and decided to get right down to business. I chose to use the Basic Boy’s Wallet tutorial from Noodlehead. 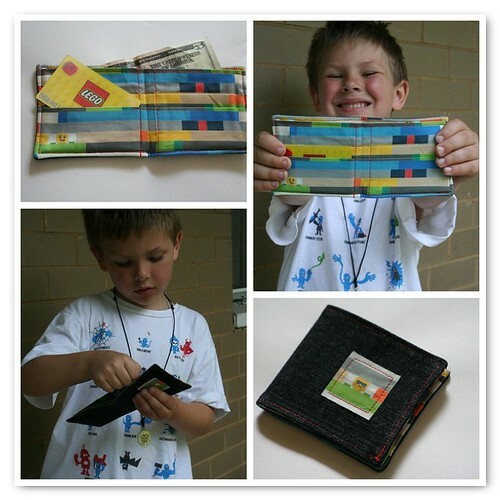 I liked the accordion fold pockets and I thought that the style of this one was most like Daddy’s. I thought he’d appreciate that the most. I also liked the way she chose to decorate the wallet, although I didn’t use her decorations ideas. I did find several other tutorials that I liked with different features, they are listed at the end of this post. I had some Lego Fabric from Spoonflower leftover from the gift bags for Caleb’s party that I decided to use for the lining. I used some dark denim for the outer layer and fussy-cut a minifig head for the decoration on the front of the wallet. The denim was a little stiffer than the suiting fabric recommended by Noodlehead, so it was a little bit difficult to sew, but not so difficult that I had to give up. The whole project took me about an hour and my little man is thrilled! RePlayGround | Shirt Cuff Wallet – Clever wallet that uses the cuff of a men’s button-down shirt. Uses the button on the cuff as a wallet closure and has an unfinished edge on the sleeve side of the cuff. Lola Nova | Summer Wallet Tutorial – This wallet is quite basic like the one from Noodlehead. Has a button closure and uses separate pieces of fabric for the card pockets for a scrappy look. ::verypurpleperson:: | Boy’s Wallet – I love this wallet, but it had a few more features than I wanted to tackle today. Has a zipper pouch on the outside, an elastic for closure, and has a hook-and-loop closure pocket for coins. Tagged 2012, Caleb, card, cotton, denim, July, lego, minifig, minifigure, money, spoonflower, wallet. Hi Lisa! Thanks for designing such great lego fabric. 🙂 I made little draw string bags from it for the birthday party and filled them with lots of “lego” goodies I got from Etsy, I just haven’t gotten around to blogging about that project yet.